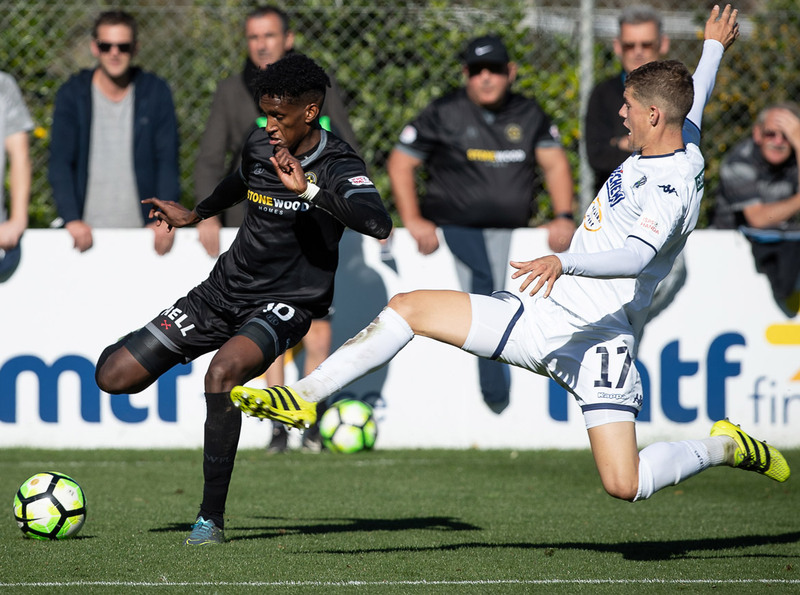 As many fans expected, New Zealand domestic rivals Team Wellington and Auckland City FC were inseparable in the first leg of their OFC Champions League semi-final which ended in a 0-0 draw at Dave Farrington Park in Wellington this afternoon. Having most recently met in a tightly contested national Premiership Grand Final, which Auckland City won 1-0, today’s first meeting between the two sides at regional level since the 2017 OFC Champions League final was expected to be another close race. While the home side were quickest to find their rhythm, it was Auckland City who had the first decent chance when an Emiliano Tade free kick was curled just over the cross bar just on 10 minutes. The Navy Blues’ confidence grew as Te Atawhai Hudson-Wihongi forced a fantastic save from Team Wellington’s goalkeeper Scott Basalaj. Wellington weren’t without chances of their own, Angus Kilkolly’s one vs. one effort with City’s Enaut Zubikarai was a close call and a short time later he had another brilliant opportunity which he put just over the cross bar on the volley. As the clock started counting down in the second half not even the introduction of fleet-footed playmaker Micah Lea’alafa could break down Team Wellington’s defences, while the home side were finding it equally difficult to challenge their rivals. Team Wellington coach Jose Figueira said with any match the objective is to win, but given the semi-final extends over two legs he’s happy with how today’s match turned out. “We said earlier in the week, it’s not just one match. It’s 180 minutes of a semi-final and we’re only half way through it now,” he explained. Auckland City coach Ramon Tribulietx also pointed to the two legs being a factor requiring consideration, but was certainly disappointed an away goal wasn’t forthcoming. “I’m happy with the effort and the way we competed,” he said. “We know the difficulties of travelling down here. We didn’t get an away goal which is not good for us, but the way we competed in the game, especially in the moments were it became very even, very transitional, we were good. Tribulietx pointed to a couple of clear cut chances for his side having the potential to of changed the outcome, but said his side were also let off in a couple of cases as well, with Team Wellington getting opportunities too. The two sides will meet again in the second leg of the fixture in one week’s time, this time at Kiwitea Street in Auckland where there will be everything to play for.